Four tips for making your resume a perfect match for any opening. When a hiring manager reviews your resume you want them to say, “Wow! That person sounds like the perfect fit for the job!” And then, of course, they call you for the interview! So how do you create a resume that communicates that you’re exactly what they’re looking for in a new employee? Below are four tips for creating a perfect match resume. Remember, you always want to tweak your resume when you apply for a job. No two positions are exactly alike, and each employer is going to have different standards and requirements that are very important to them. Key in on those requirements, and be sure to incorporate them into your resume. You’ll know what these requirements are by reviewing the job advertisement and noting special keywords throughout; or, in most cases, the employer will state required skills or preferred qualifications. You’re a perfect match when you meet all of the required and preferred qualifications. Which leads me to my next point. 2. Required and preferred skills are essential. When reviewing the description for a job opening, be careful to note exactly what the employer lists as required and preferred. This is critical information. 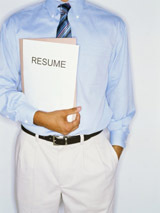 You want to make sure your resume communicates very clearly that you possess all of the required skills. This means you’re capable of doing the job and performing the essential functions. Preferred qualifications are the employer’s wish list of things they’d like to have in a new employee. They can live without them, but if you can prove you possess them, you just upped the ante for the other candidates being considered and are one step closer to positioning yourself as the ideal candidate. 3. Keywords are a must. Scan the opening for important keywords listed throughout. Chances are any recruiter or HR person is going to use these keywords when searching job boards for your resume. You want to make sure these keywords are listed throughout your resume or the applicant tracking software the organization is using won’t pull your resume in the search results. 4. Don’t forget about branding. Branding your resume is important to your job search, but it is also vital to proving you’re the perfect fit for an opening. You need to think about what makes you unique as a candidate. What can you offer that others can’t? Show the employer you can offer them value and benefit that others cannot. Do this through a branding statement, branded career summary, and metrics driven accomplishment statements. Creating a resume that communicates you’re a perfect fit for an open position can be challenging, but following these simple tips can make the process easier and less painstaking.